Tidings of Joy Holiday Basket by TastefulTreats.com at 365 Days Of Kindness. Hurry! Limited time offer. Offer valid only while supplies last. An elegant gourmet basket to send for the holiday season. 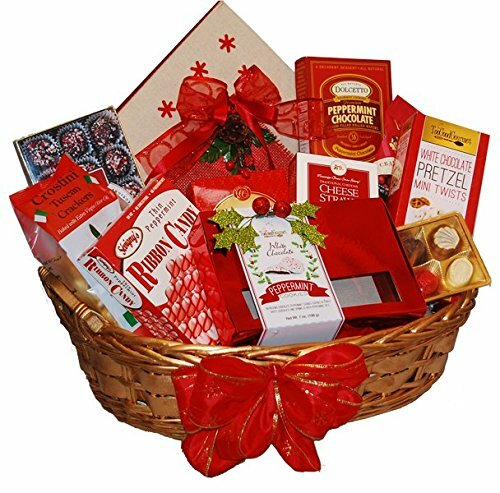 Measuring 20 x 12 x 15 inches this Christmas gift basket is filled with a variety of chocolates, nuts, candy, crackers, cookies, cheese straws, pretzels and popcorn. A beautiful fabric covered Christmas box is a keepsake box filled with cookies, candy and more. The box will remain as a keepsake long after the holiday is over. Beautifully wrapped with a personalized card message. If you have any questions about this product by TastefulTreats.com, contact us by completing and submitting the form below. If you are looking for a specif part number, please include it with your message.